Recent efforts in the investigation of chromatographic characterization of molecularly imprinted polymers (MIPs) have focused mainly on the nature of heterogeneous binding sites. More data on the thermodynamics than on the kinetic features of MIP columns have been published. The present article addresses the sources of peak broadening and tailing, which are the main drawbacks often associated with imprinted polymers in chromatography for practical applications. With use of the theory of nonlinear chromatography, the peak properties of a MIP column, including the retention and peak broadening and tailing, can be well interpreted. Efforts to improve chromatographic efficiency using MIPs prepared by approaches different from the conventional method, including covalent imprinting and the format of uniformly sized spherical microbeads, are reviewed and discussed. 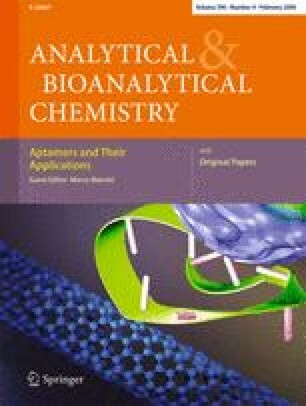 This review leads to the conclusion that nonlinear chromatography theory is useful for characterizing chromatographic features of MIP columns, since a MIP is essentially an affinity-based chromatographic stationary phase. We expect more theoretical and experimental studies on the kinetic aspects of MIP columns, especially the factors influencing the apparent rate constant, as well as the analysis of the influences of mobile-phase composition on the chromatographic performance. In addition to revealing the affinity interaction by molecular recognition, slow nonspecific interactions which may be inherited from the imperfect imprinting and may be involved in the rebinding of the template to MIPs also need to be characterized. The peak broadening and tailing associated often with molecularly imprinted polymers (MIPs) in column chromatography for practical applications can be well characterized by the theory of nonlinear chromatography.